Most television audiences will be familiar with the work of Kay Mellor. From Fat Friends and Playing the Field to The Syndicate, the writer/director of 'In the Club' has always exhibited a strong desire to tell honest, Northern, family-driven stories with humour and warmth. The first episode of In The Club sees Mellor deliver what her audiences have to come to expect. An entertaining and often moving hour, the episode focuses on six expectant mothers and their families as they try to navigate the later stages of their pregnancies. Brought together towards the end of the episode, we learn that the six all know each other from an almost implausibly popular hospital led antenatal group. But, for those who might be expecting this show to be a sit-down discussion about piles and swollen ankles (the scenes where these discussions occur are thankfully few and far between, almost there as a knowing nod to people who expect pregnant women to only be concerned with their physical condition rather than anything else); there is a lot more going on underneath the surface of each of the characters' lives. What seem to be the strongest of these stories bear the most weight in this first episode, with two of the mothers being brought to the fore. The most engaging of these is 15 year old Rosie and her heart-breaking struggle with a secret pregnancy confused by the neglectful adults in her life to be weight gain. We follow her as she is bullied on her way home from school, mourns her late mother by embracing the last remnant of her smell from a dressing gown and tries to learn more about child birth by watching television documentaries. 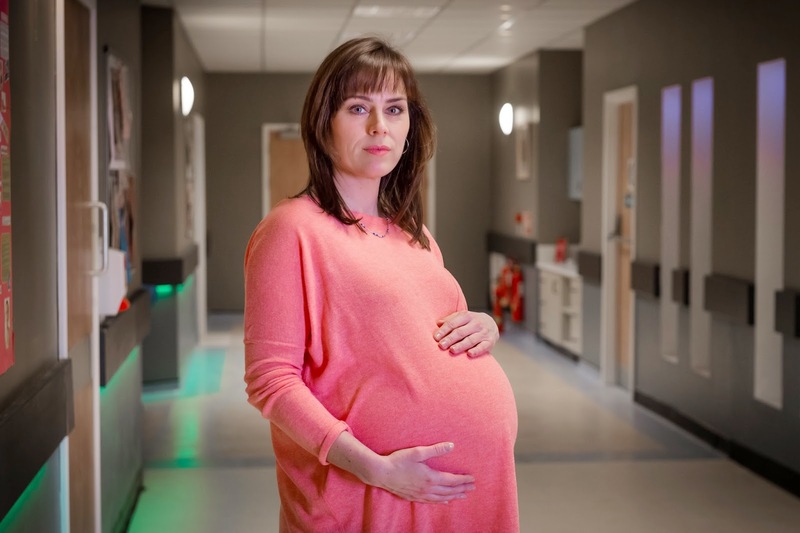 Played by Hannah Midgely, Rosie's story is entirely believable, allowing Mellor to draw upon her own experiences as a young mother in as sympathetic a depiction of teenage pregnancy as I've seen on television in recent years. Midgely's performance is just the right balance of fear, loneliness and hidden strength. The other mother featured this week is Jill Halfpenny's Diane, an older woman who contrasts nicely against Rosie's lack of experience. Having adopted in the past, she has finally conceived naturally and learns in the opening scenes of the episode that she is having twins. What she doesn't know, however, is that her husband (played by Will Mellor, who always excels in this kind of role) has been made redundant five months previously and the family is on the brink of financial ruin. As Diane uncovers this secret and tries to come to terms with the deceit, Mellor's character makes another catastrophic mistake that will have immediate repercussions for them all. In this mistake, we come across an element of 'In the Club' that jars slightly, despite the strong characterisation and the flexible format which encourages the episode to move freely from story to story, making for an enjoyable hour of entertainment. It's related to the idea of over-dramatising which, as I type it, sounds a little bonkers. Drama is good. You need a lot of drama and story to fill six hours of screen time. However, the established stories in this first episode are taken to levels within their hour which make me concerned for where they could possibly have left to go over the next five episodes: Rosie has not only had her child but her father has also crashed off the road in his van, leaving his life in jeopardy. Rick has robbed a bank to get some money in a fit of madness and is already being pursued by the police: how much worse can it get for them over the next five hours? And if it does get worse (which it will surely have to), are we perhaps risking a realistic and down to earth portrayal for stories which challenge an audience's suspension of disbelief? And if so, is this too much at odds with what 'In the Club' initially appears to be offering? That said, this opening episode surprised me with its pace and, for all of my worry about where the stories might go, the narrative was slick with unexpected twists and turns. With four other women's lives to investigate, I'm sure that the audience will be tuning in for the full six weeks, just as I will. In the Club Continues Tuesday's at 9.00pm on BBC ONE.